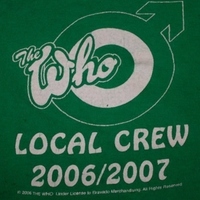 A local crew t-shirt for the Who’s 2006-2007 tour. The Who is an English rock band that are considered to be one of the greatest musical influences in rock music of the 20th century. Formed in 1964, they have gone on to sell over 100 million albums and continue to be one of the highest grossing touring bands of all time. The band’s 2006-2007 tour was in support of their album, Endless Wire, and was their first worldwide concert tour since 1997. The lineup for the tour included Roger Daltrey on vocals, Pete Townshend on guitar and vocals, Brian Kehew on keyboard, Pino Palladino on bass, Zak Starkey on drums, and Simon Townshend on guitar and vocals. 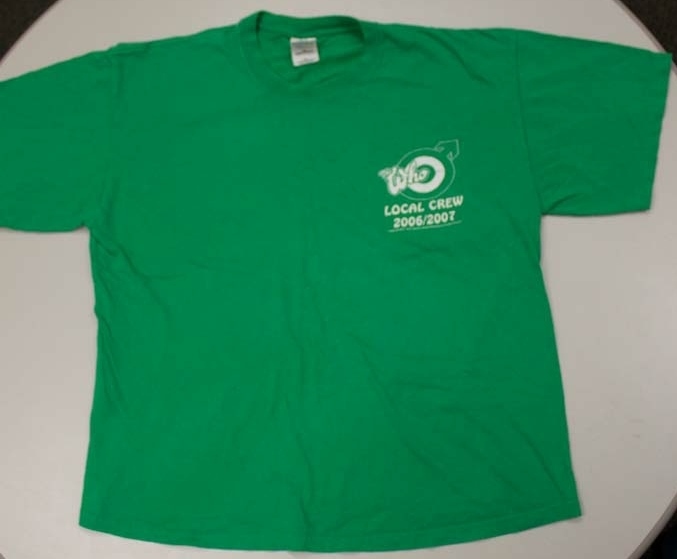 The shirt was donated by Mick Dolan, who was a local crew member for the band’s show at the Ford Amphitheatre, located at 4802 North US Highway 301 in Tampa, Florida, on March 25, 2007. The show initially occurred on March 13, but abruptly ended when Daltrey was unable to sing due to a respiratory infection. Townshend stopped the band and apologized to the crowd, and the band’s manager, Bill Curbishley, rescheduled the show. There were 9,500 in attendance, and the supporting act was Rose Hill Drive. Originally created by Bravado Merchandising. Copyright to this resource is held by The Who and is provided here by RICHES of Central Florida for educational purposes only. Marsh, Dave. Before I Get Old: The Story of the Who. New York: St. Martin's Press, 1983. Parker, Alan G. The Who By Numbers: The Story of the Who Through Their Music. Helter Skelter Publishing, 2010. "The Who Concert Guide." The WhoLive.net. http://www.thewholive.net/concert/index.php?GroupID=1&id=1709&Jahr=2007 (accessed November 12, 2015). Ross, Curtis. "The Who Make Howling Return To Tampa." Tampa Tribune (March 26, 2007). http://www.thewholive.net/review/index.php?showid=1709&reviewid=328&GroupID=1. 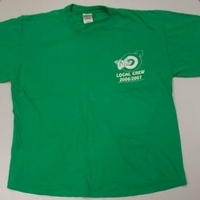 Bravado Merchandising. 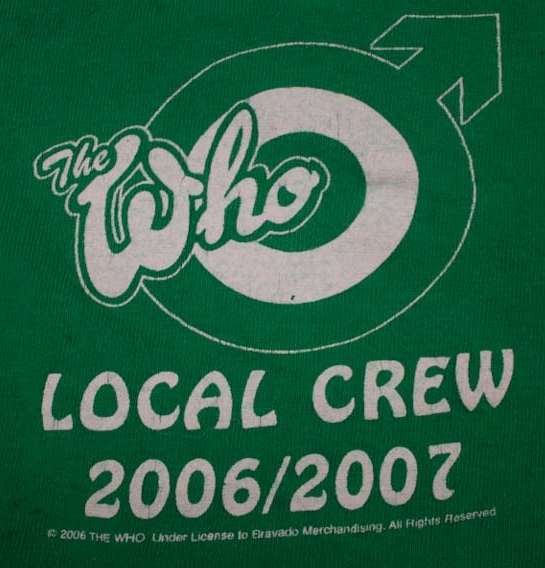 “The Who Local Crew T-Shirt.” RICHES of Central Florida accessed April 23, 2019, https://richesmi.cah.ucf.edu/omeka/items/show/6217.